Three months before the 2016 election, Donald Trump Jr. (pictured) and other Trump campaign advisors met envoys from Gulf States offering help to ensure Donald Trump Sr.’s victory. 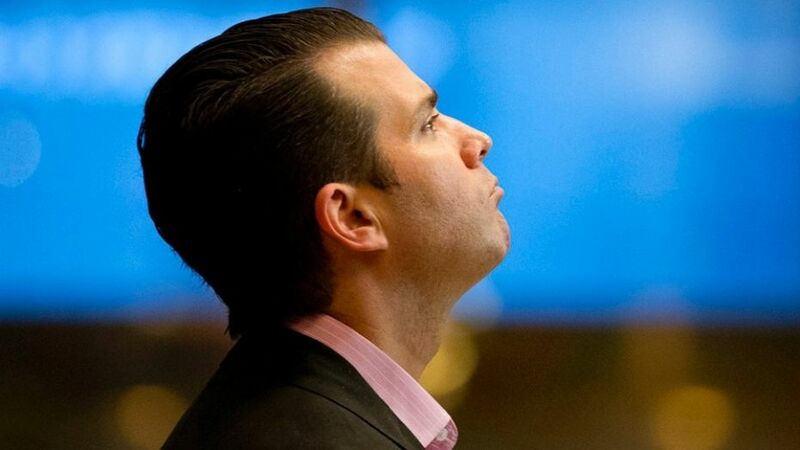 The revelation complements stories of the Trump campaign’s involvement with Russian officials, including envoys who met Trump Jr., Donald Trump Sr.’s son-in-law Jared Kushner, and campaign manager Paul Manafort in June 2016 to discuss the provision of material damaging to Democratic nominee Hillary Clinton. The meeting on August 3 with the Gulf envoys also took place in Trump Tower. Erik Prince, the founder of the paramilitary firm Blackwater, arranged the encounter. George Nader, the emissary of a prince in the United Arab Emirates, said the monarchies of the UAE and Saudi Arabia were eager to help Donald Trump Sr.
Social media specialist Joel Zamel, whose company employed several former Israeli intelligence officers, presented a proposal for a multimillion-dollar social media manipulation effort. Zamel’s firm was working on a plan involving thousands of fake social media accounts to promote Trump’s candidacy on platforms like Facebook. Trump Jr. responded with enthusiasm, according to “a person with knowledge of the meeting”. Nader met frequently with Kushner and with Michael Flynn, later National Security Advisor in the Trump Administration. At the time, the Gulf emissary was promoting a secret plan to use private contractors to destabilize Iran. After Trump was elected, Nader paid Zamel up to $2 million, according to an associate. Special Counsel Robert Mueller is reportedly investigating the Gulf connections with the Trump campaign and transition as part of his Trump-Russia inquiry. Nader is cooperating, and Mueller’s team have questioned numerous witnesses in Washington, New York, Atlanta, Tel Aviv, and elsewhere. In early January, Nader — who visited Russia twice during the US campaign — arranged a meeting in the Seychelles between Prince and Kirill Dmitriev, a Russian wealth fund manager with ties to President Vladimir Putin. Zamel also has a Russian connection, with one of his firms working for oligarchs linked to Mr. Putin, including Oleg Deripaska — a former business associate of Trump campaign manager Manafort — and Dmitry Rybolovlev. It is illegal for foreign governments or individuals to be involved in US elections. However, “two people familiar with the meetings” said Trump campaign officials did not appear bothered. On November 30, 2017, Prince testified under oath to the House Intelligence Committee, that he had no formal communication or contact with the Trump campaign. He said he met Trump Jr. once “at a campaign event” and again at Trump Tower “during the transition”, but never mentioned the discussion in August 2016. Prior to the 2016 election, Donald Trump Jr. recalls a meeting with Erik Prince, George Nader, and another individual who may be Joel Zamel. They pitched Mr. Trump Jr. on a social media platform or marketing strategy. He was not interested and that was the end of it.